I’ve just returned from the Bouchercon crime convention in Albany NY, USA, where George Easter of Deadly Pleasures magazine presented me with the Barry Award for Best Mystery Novel for “The Blackhouse”. In previous years, there were separate awards for US and UK writers, but this is the first year that the awards were combined and books from both sides of the Atlantic were pitted against one another. It made winning the prize all the more special to know that “The Blackhouse” had been up against all the American big guns of this year, such as the phenomenal best seller “Gone Girl” by Gillian Flynn! It was also special for me because, although “The Blackhouse” has won several major literature awards in France, where it was first published, this is the first prize for the English language version of the book. It’s hard to believe, looking back, that this was the same book that was was turned down by every major publisher in the UK. I had set it aside and gone on to write other books, really believing “The Blackhouse” to be a lost cause. I owe a special debt of gratitude to my French publisher, Danielle Dastugue of Le Rouergue, who saved the book from oblivion. Everything changed with one chance conversation we had when I mentioned “The Blackhouse” to her. She asked to read it, loved it and bought world rights. She had it translated into French and took the Frankfurt book fair by storm, with publishers from all over Europe bidding for the rights. And it was the French version that was read by the book scout for award-winning young publishing house Quercus – a UK publisher that had not even existed when the book was first offered to British publishers. They immediately stepped in to buy the English language rights and were the ones to commission a further two books to create what has become known as The Lewis Trilogy. The rest is now history. Quercus’ belief in the book was endorsed by the Richard and Judy Book Club who picked it for their Autumn 2011 selection. UK readers shared their enthusiasm, voting it their “Best Read” and turning the book into a major best-seller. Books 2 and 3 in The Lewis Trilogy, “The Lewis Man” and “The Chessmen“, have already become bestsellers, and the three books have sold almost a million copies in the UK alone. “The Blackhouse” was first published in the USA at the end of 2012. The paperback will be published there in Spring of 2014 by Quercus Inc., with “The Lewis Man” coming out in hard cover in October 2014. Here is a video of me at the awards ceremony, receiving the Barry Award from George Easter. The video might not be very clear, but the audio quality is good enough to hear my speech. 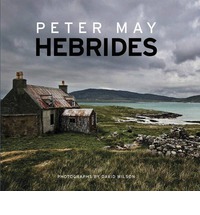 And in other news, this week saw the publication in the UK of “Hebrides” the photo companion to the Lewis Trilogy. More than 200 beautiful pictures by photographer David Wilson illustrate the locations from the trilogy, alongside a text that I have written charting the history of the islands and my personal relationship with them. 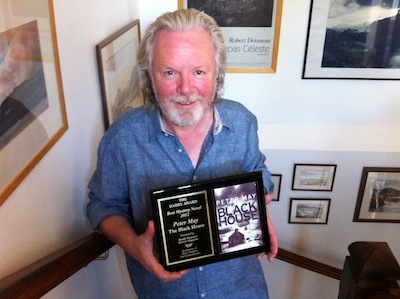 This entry was posted in Uncategorized and tagged Barry Award, Hebrides, Lewis Trilogy, Peter May, The Blackhouse. Bookmark the permalink. Congratulations – a well deserved award! Coincidentally, the BBC adaptation on Radio Scotland has just finished as I type this. Since your last post I have enjoyed all the Chinese Thrillers and The Enzo Files, which are happily now available on Kindle, as you advised. I loved them all, but I think my favourite File is Freeze Frame – a terrific book! I look forward to the publication of your new novel. Thanks, Joan Delighted that you are enjoying all the books. The new one is called “Entry Island”, and will be out in January. Absolutely delighted for you and it is no surprise. From the moment I picked up The Blackhouse I became a great fan of your work. Not only are you a beautiful writer but the way you weave the power of nature into the reader’s psyche is both thrilling and sensual. I felt as if I experienced the Isle of Lewis without getting up from my chair. Think there will be more awards for the trilogy. Superb. Looking forward to your next book. You’ve got me blushing, Frances! Thanks, Mairi. Just over 3 months till “Entry Island” hits the shelves, but available on Kindle from before Christmas. An inspirational award – Fantastic Peter – and this book was turned down by UK publishers! Thank goodness the ‘Auld Alliance’ came through for you and for us your loyal readers. Keep writing Peter so we can keep reading your great work. 🙂 Thanks, Thomas. New one out in January to keep you out of mischief! Excellent! I read, and thoroughly enjoyed this! Well done! A copy of Hebrides will be on my Christmas list too! Hope you’ll enjoy the Hebrides book, then, Janey! I could not wait for the U.S. publications. I ordered The Lewis Man, The Chessmen, and Hebrides from Book Depository. I plan on reading them before the year is out. I still can’t believe I missed you at Bouchercon. I will not do that again, and I will have books for your signature then. Congratulations on the Barry Award. Well deserved and my choice for sure! So very well deserved…I read the book twice in a row to see if knowing how it ended would give me a different perspective, and honestly it didn’t, I found myself lost in the story just like the first time 🙂 I honestly can’t believe it wasn’t scooped up by the very first publisher that read it, it’s clearly a classic.